Captain Cook Cruises and Sea Life Sydney Aquarium are offering the ultimate day out for kids and adult marine lovers, with a Sea Life Sydney Aquarium and Whale Watching Cruise combo. The fun filled combo operates daily until 31 October 2018 and offers savings of up to $40 per person. The package starts with a morning visit to one of Sydney’s leading family tourist attractions, Sea Life, in Darling Harbour. Walk underwater through over 100 metres of glass viewing tunnels and see Australia’s marine life like never before! Come within inches of huge sharks, rays and turtles and see some of Australia’s remarkable marine and freshwater animals. Watch three different penguin species slip, slide and swim around playfully including King Penguins, Gentoo Penguins and Little Penguins. Before embarking on one of the Captain Cook Cruises to experience seeing whales in the wild, guests will have the opportunity to learn more about whale migration at Sea Life Sydney Aquarium’s on-site activity hub. Every guest to the hub will receive a limited edition take-home poster. The activity will take place at Sea Life Sydney Aquarium. 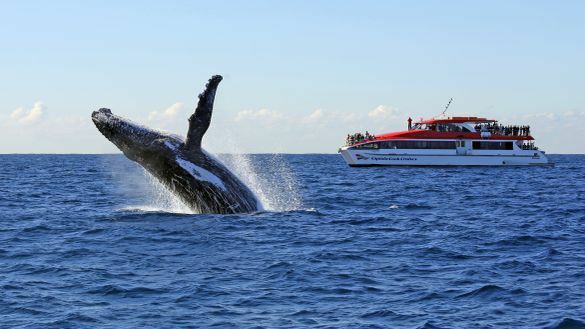 After exploring the aquarium it’s time to see Whales at play on a Captain Cook Cruises afternoon Whale Watching cruise. In only 15 minutes this fantastic open-water cruise takes passengers from Circular Quay, past the Sydney Opera House, Fort Denison and the beautiful eastern suburbs, before passing through the Harbour headlands and out to the open ocean. Captain Cook Cruises offers every passenger a whale guarantee; if a whale is not spotted, passengers can cruise again for free. Whale watching cruises are operated on ocean-going catamarans “Maggie Cat” and the new “Nancy Wake”, both equipped with two passenger decks and spacious outdoor and indoor viewing areas including an all-weather lounge, ideal for the entire family. The Sea Life Aquarium and Whale Watching Cruise combo is priced at $99 per adult and $69 per child (4-15 years) and includes morning entry into Sea Life Aquarium at Darling Harbour, a one-way rocket ferry from Darling Harbour to Circular Quay and a 1.30pm Captain Cook Cruises Whale Watching cruise departing from Wharf 6, Circular Quay.